Nicknamed the Mile City because its official elevation measures exactly one mile above sea level, Denver is the largest city in Colorado and its capital. Incorporated as a city in 1861 with less than 5,000 residents, Denver experienced significant growth when it was connected to the transcontinental railroad in 1870. Powered by the development of new industries, that growth largely continued until the 1980s, when the city’s population reached more than half a million residents, before briefly falling. With its population rebounding in the 1990s due to an influx of young Americans from across the country and a surge of Mexican immigrants, Denver quickly recovered from the population losses it experienced a decade earlier. In fact, it is now the fastest growing major city in the U.S., with a 2015 estimated population of 682,545, a 14 percent increase from 2010. The city is 69 percent white American, 10 percent African American, and 3 percent Asian American. Approximately one-third of the population identifies as Hispanic or Latino American, and residents in their 20s and early 30s now make up Denver's largest age groups. Denver is a leader in transit-oriented development, one of the city’s many contributions to community wealth building. For instance, the T-REX project, approved by voters in 1999, built a new 19 mile double-track light rail transit system with 13 new LRT stations, many of which have become the sites of transit-oriented development projects. To help ensure the creation and preservation of affordable housing in transit corridors, several Denver groups including the Urban Land Conservancy, Enterprise Community Partners, and the City and County of Denver, launched the Denver Transit-Oriented Development Fund in 2010. The revolving loan fund, which currently totals $24 million, is credited with preserving or creating 626 affordable homes and 120,000 square feet of commercial space, and creating over 700 jobs. A partnership between private, philanthropic, and nonprofit organizations, Mile High Connects also focuses on developing inclusive, affordable, and livable communities within walking distance of transit. Through its MHC Grant Fund, the nonprofit supports effective, inclusive approaches to building healthy, prosperous transit-oriented communities and is particularly interested in enabling under-resourced residents to help address transit equity issues. Denver is also home to other notable community wealth initiatives. The Urban Land Conservancy (ULC) contributes to the surrounding community in a variety of ways, helping to secure land so that it remains affordable for schools, affordable housing, and office space for nonprofits, while also providing financing and coordination to local community projects and initiatives. As of 2015, ULC had invested nearly $68 million in community real estate, leveraging $115 million for the development of affordable housing and nonprofit facilities. Another organization, Belay Enterprises, founded Bud's Warehouse, a career and life-skills training social enterprise that employs individuals rebuilding their lives from addiction, homelessness, or prison. With the profits from Bud’s Warehouse, the nonprofit has been able to incubate several other businesses, several of which have been spun off after reaching self-sufficiency. Also focused on entrepreneurship, Mi Casa aims to foster the economic success of Denver’s Latino and working families. In 2015, its business center served 2,724 people and helped launch 82 new businesses. Archway Housing & Services (previously Rocky Mountain HDC, Inc.) aims to build healthier communities by providing quality, affordable housing with supportive services to low and moderate income families in Metro Denver. Since its founding in 1995, the nonprofit has developed 363 units of affordable housing with on-site programs and services for youth and adult residents. Currently under development is Archway’s 40 West Residence project, which will include 60 affordable units with 25 reserved for homeless veterans. Established in 1984, the Colorado Coalition for the Homeless (CCH) works to prevent homelessness and to create solutions to stem future homelessness. Based in Denver, CCH currently manages over 1,600 affordable housing units with integrated services, including counseling, life skills training, financial literacy and employment assistance. The nonprofit serves about 18,000 people a year. Guided by a mission to create diverse, healthy communities through quality, service-enriched, affordable housing, Hope Communities manages four rental properties in Northeast Denver. Founded in 1980, Hope Communities now owns 280 affordable rental units for low-income families. NEWSED Community Development Corporation works to promote holistic social and economic development in disadvantaged, primarily Latino, Denver communities by: securing and coordinating resources for neighborhood revitalization; developing shopping areas and services; fostering minority and neighborhood business ownership, job retention and creation; increasing home ownership and affordable rental opportunities; engaging in neighborhood organizing; and hosting cultural events and activities. Since its establishment in 1973, the CDC is credited with developing over 650,000 square feet of housing and retail/commercial real estate. Northeast Denver Housing Center aims to create sustainable, healthy housing opportunities for underserved households through outreach, education and housing development. Since its establishment in 1982, NDHC has developed over 800 housing units, provided housing counseling to over 9,500 households, and improved over 300 homes by reducing or eliminating lead poisoning, reducing asthma triggers, and increasing energy efficiency. Based in Denver, Rocky Mountain Communities provides affordable housing and supportive services in its eight housing developments across Colorado (four of which are in the Denver metropolitan area). Founded in 1992, the nonprofit now provides housing to more than 1,300 families. Based in Denver, Colorado Enterprise Fund (CEF) provides loans to small and emerging Colorado businesses unable to secure traditional bank financing. Since its establishment in 1976, CEF has made more than 1,800 loans totaling $54 million, investments credited with creating or retaining more than 16,000 jobs. Based in Denver, Colorado Housing Assistance Corporation (CHAC) strives to ensure that low and moderate income state residents can afford housing and achieve successful homeownership. Since its founding in 1982, CHAC has helped more than 7,500 first-time home buyers with down payments and closing costs, and prevented nearly 1,000 families from foreclosure. Founded in 1999 as a community-based, nonprofit organization providing early-stage capital for entities developing affordable housing, Mile High Community Loan Fund is now an $18 million fund that helps finance: the development or preservation of affordable housing; the development, redevelopment or renovation of commercial real estate; and the purchase, rehabilitation and/or construction of facility space by nonprofits serving low-income populations. As of the end of 2015, the fund had approved 155 loans totaling more than $59 million, which helped finance more than 6,700 units of affordable housing and more than 385,000 square feet of nonprofit facility space. Native American Bank was founded in 2001 by a group of Tribal Nations and Alaska Native Corporations. Based in Denver, the Bank provides affordable and flexible banking and financial services to Native American and Alaskan Native individuals, enterprises, and governments as a way to foster economic independence, development and sustainability. The only national American Indian owned community development bank in the country, as of 2015 it had more than $77 million in assets. Founded in 2002 as Lowry CLT, Colorado Community Last Trust (CCLT) originally focused on redeveloping the former Lowry Air Force Base. 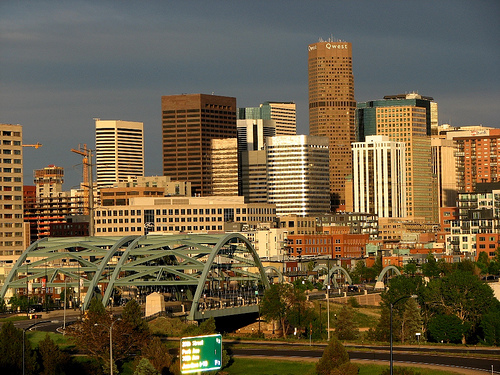 In 2006, the land trust expanded its reach to the entire Denver metropolitan area. With a mission to preserve affordable home ownership in perpetuity for modest income households, CCLT has developed 172 townhomes and 17 single-family homes. Established in 1934 and open to anyone in Adams, Arapahoe, Jefferson, or Denver Counties, Denver Community Credit Union (DCCU) now has nearly 25,000 members and 4 branches across the city. With $281 million in assets, DCCU is also heavily involved in the community, providing 2,646 community members with free financial education in 2015 alone. In August 2016, it was announced that DCCU would be merging with nearby Sooper Credit Union to form an institution with more than $620 million in assets and nine Colorado locations. Founded in 2003, the Urban Land Conservancy (ULC) acquires, develops, and preserves community land and assets in urban areas for schools, affordable housing, community centers, and office space for non-profits. Securing land at today’s prices allows ULC to ensure that the space will remain affordable and accessible for future community endeavors. ULC also provides capital, resources, and coordination to other organizations for community development projects. As of 2015, ULC had invested nearly $68 million in community real estate, leveraging $115 million for the development of affordable housing and nonprofit facilities. With more than 24,000 employees and $5.4 billion in revenue, CH2M Hill, Inc. is a majority employee owned global engineering and operations business. It has also won numerous awards for its environmental sustainability approach and for having an excellent employee work environment. In 2014, Engineering News-Record voted CH2M Hill to its Top 100 Green Buildings Design Firms and to its Top 200 Environmental Firms Sourcebook. The company has been named on FORTUNE’s “100 Best Companies to Work For” list four times. Founded in 1952, GH Phipps is a full service Construction Manager/General Contractor, involved in the medical, education, religious, high-tech, commercial, and public arenas. With revenues exceeding $240 million and over 100 employee owners, GH Phipps is one of Colorado’s largest contractors and was responsible for constructing Invesco Field, home of the Denver Broncos, at Mile High. Worker-owned with 500 employees, Trinidad Benham Corporation is a merchandising, packaging, trading and distribution company. It is the largest independent marketer of dry edible beans and rice in the United States and the leading packager of household and food service foil products. Based in Denver, Gary Community Investments is a certified B corporation that provides philanthropic, near market-rate, and market-rate capital to efforts that support Colorado’s low-income children and families. Investments made in 2016 include a $500,000 PRI in support of Denver’s Social Impact Bond Program, which provides permanent housing and supportive services to 250 chronically homeless individuals. Gary Community Investments aims to invest all of its financial assets into community and business vehicles focused on improving the lives of Denver children and families by 2035. Operating since 1976, Mi Casa focuses on fostering the economic success of Denver’s Latino and working families. Through its Mi Casa Women’s Business Center, the nonprofit offers entrepreneurial training, business counseling, technology training, and networking opportunities to support entrepreneurs and emerging businesses. In 2015, Mi Casa served 2,724 people and helped launch 82 new businesses. To diversify and expand its revenue base, Mi Casa also operates two social enterprises, Mi Casa BackOffice Solutions, which provides nonprofits and small businesses with accounting and bookkeeping services, and Mi Casa TalentSolutions, which is a staffing agency specializing in bilingual talent. Based in Denver, the Rocky Mountain Employee Ownership Center (RMEOC) strives to nurture an economic system characterized by inclusion by advocating for and providing pathways to employee ownership. To do so, RMEOC offers consultation services to business owners interested in transitioning to employee ownership and promotes employee ownership across the region by advancing legislation and fostering a range of educational events and efforts. Founded in 2008, the Rocky Mountain MicroFinance Institute (RMMFI) fosters entrepreneurship as a way to create economic and social mobility. To do so, RMMFI provides skill-building, mentorship, and small loans to low and moderate income entrepreneurs. Its Business Launch Boot Camp is credited with graduating entrepreneurs who currently own and operate 31 area businesses. Established in 1985 to help Denver residents create sustainable, food-producing neighborhood gardens, Denver Urban Gardens now operates 157 community gardens in the Denver metro area (including 46 school-based sites)—which together grow more than 610 tons of fresh produce a year—and an educational farm, DeLaney Community Farm. The nonprofit also runs several training programs for youth and adults. Launched in 2007, Re:Vision aims to work with people in Denver’s economically marginalized neighborhoods to develop resident leaders, cultivate community food systems, and build a locally-owned economy. Through its Backyard Gardens program, it provides low-income families with the resources and technical assistance needed to create high-production organic vegetable gardens. The nonprofit also runs a community urban farm, which includes a greenhouse, fruit orchard, demonstration beehive, and over 10,000 square feet of production beds. To empower people to choose healthier food, in 2015 it built a new educational kitchen space to support cooking, nutrition, and food preservation classes for community members. It is now working with community residents to develop a member-owned and operated grocery store in Westwood, a current food desert. 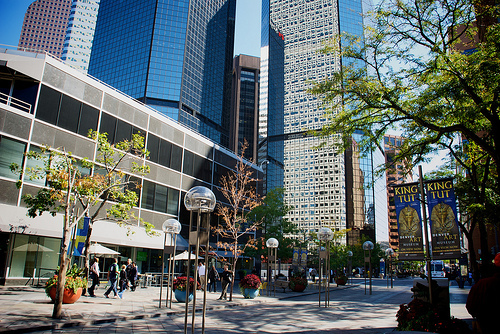 The City of Denver decided to use public ownership as a strategy to finance the development of a 37-floor, 1,100-room hotel with 1.25 million square feet of building area to support the nearby city-owned convention center. The facility, opened in December 2005 and renovated in 2014, is managed by the Hyatt Regency hotel chain. Belay Enterprises was started in 1994 by a group of local businessmen, community leaders, and pastors who wanted to make a difference for the urban community. Out of their vision grew Bud’s Warehouse, a home improvement thrift store selling donated and recycled building materials that also provides career and life-skills training for individuals seeking to rebuild their lives. With the profits from Bud’s Warehouse, the nonprofit has been able to incubate several other businesses, several of which have been spun off after reaching self-sufficiency. Current ventures being pursued by Belay Enterprises include Purple Door Coffee, a coffee shop that provides supportive employment to teens and young adults facing homeless, and New Beginnings Custom Woodworks, a cabinet manufacturing enterprise that provides training and employment to those who have experienced prison, addiction, or homelessness. Second Chances aims to help individuals in recovery develop the skills they need to secure employment and become self-sufficient. The nonprofit’s program is centered around its social enterprise, Second Chances Cleaning Services, which provides over 110 people a year with on-the-job training. Established by numerous partners including the Urban Land Conservancy (ULC), Enterprise Community Partners, and the City and County of Denver, the Denver Transit-Oriented Development Fund aims to support the creation and preservation of over 1,000 affordable housing units in current and future transit corridors. The revolving loan fund, which currently totals $24 million, makes capital available to purchase and hold sites for up to five years along current and future rail and high frequency bus corridors in the Denver metro region. As of 2013, the fund was credited with preserving or creating 626 affordable homes and 120,000 square-feet of commercial space, and creating over 700 jobs. The $24 million investment is expected leverage over $500 million in local economic development activity. A partnership between private, philanthropic, and nonprofit organizations committed to developing inclusive, affordable, and livable communities within walking distance of transit, Mile High Connects (MHC) works to ensure that Metro Denver’s regional transit system fosters communities that enable all residents to achieve a high quality of life. In 2013, MHC began a grant program to support effective, inclusive approaches to building healthy and prosperous transit-oriented communities and ensuring equity and opportunity for under-resourced communities. MHC’s work also focuses on influencing policy and increasing resident engagement in neighborhoods directly affected by the expanding transit system. The Regional Transportation District of Denver (RTD) is the public agency charged with providing public transportation in the metro Denver area. Committed to transit-oriented development, RTD’s investments have spurred TOD projects encompassing 31,819 residential units, 7,586 hotel rooms, nearly 6 million square feet of retail space, over 8 million square feet of office space, over 2 million square feet of government space, and nearly 7.5 million square feet of medical space. A key achievement in 2014 was the completion of Union Station, a multimodal transportation hub, integrating light rail, commuter rail, bus service, the 16th Street Mall shuttle, taxis, bicycles, and pedestrians. The project included the development of 3,171 residential units, 56 hotel rooms, and over 2.5 million square feet of office, retail, cultural, and government space. The Community Language Cooperative (CLC) provides interpreting and translation services in any language for events, meetings, medical appointments, workshops, and interviews. The co-op formed to empower its translators and interpreters to help others while obtaining a fair wage for their services. CLC currently has seven member owners. Founded in 2009 by taxi drivers frustrated by the industry’s abusive practices, Union Taxi Cooperative is a worker-owned business with about 250 driver-owners. Committed to the environment, the co-op aims to rely exclusively on energy efficient, low emission taxis. The co-op is the only cab company in Denver with a downloadable app, enabling customers to request, monitor, and rate rides.